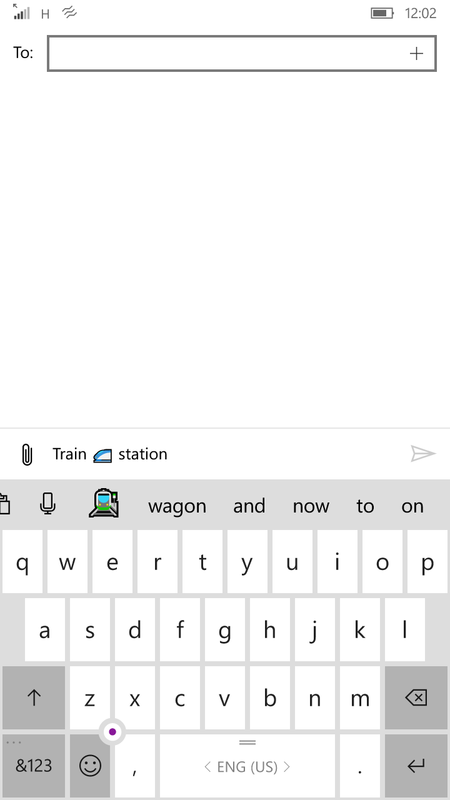 ඔයත් use කරන්නේ windows mobile එකක් එහෙමත් නැත්තන් windows phone එකක් නම් මේ කතාවලින් එකක් හරි අහලා ඇති එක පාරක් හරි. ඇත්තටම මේ කියන කතා ඇත්තමද, මොකද්ද මේවට හේතු කියලා බලමු. Windows mobile OS එක මුලින්ම release උනේ 2011දි. ඒ Windows 7.5 විදියට. එදා ඉඳන් අද වෙනකන් අවුරුදු 5ක් ගෙවිලා ගිහින් තියනවා. මේ කාලේ ඇතුලට windows 7.8, windows 8, windows 8.1, windows 8.1 update 2, windows 10 කියන main versions release වෙලා තියනවා. Full-featured app දෙකක් විදියට store එකට release කරලා තියෙන්නේ Facebook සමාගමෙන්මයි. අලුත්ම complete app එකක් Viber එකෙන් release කරලා තියනවා Video call එක්කම. මේකෙත් අලුත්ම app එකක් release කරා Android/iOS වගේම. තාමත් development ඉවර නැහැ. Beta version එකක් test වෙනවා මේ article එකක් ලියන වෙලාවෙත්. අලුත් UI improvements එක්ක release වෙයි ළඟදීම. අලුත්ම app එකක් release කරා අනිත් platform වල වගේම features තියන. windows store එකෙත් තියනවා complete app එකක්. අනිත් platform වලටත් වඩා හොඳ, responsive app එකක් windows store එකේ තියෙනවා. අලුත් version එකක් ළඟදීම release කරනවා. අලුත්ම app එකක් release කරා windows 10 වලටම. මීට අමතරව Operamini Browser, UC Browser, Shazam, Ebay, Adobe Reader, PicsArt, Vine, QR Scanner, VLC Player වගේ apps, Temple Run, Angry Birds, Subway Surfers, Talking Tom, Candy Crush වගේ ජනප්‍රිය game ගොඩක් windows store එකේ තියනවා. දැන් තව දුරටත් ‘ඇප්ස් නෑනේ බන්’ වලංගු කතාවක් නෙමේ. මොකද primary apps හැම එකම වගේ windows වලට තියනවා. මොකද apps ගොඩක් තිබ්බා කියලා සේරම phone එකේ install කරගන්න නෙමේනේ. මේ කතාව ඇත්ත. මේ වගේ එකක් කිව්වොත් පිළිගන්න වෙනවා. මොකද COC windows වලට නැහැ. මේකට හේතුව windows වල අඩුපාඩුවක් කියනවටත් වැඩිය Developersලගේ අතේ තියන දෙයක් කියනවා නම් වඩා ගැලපෙනවා. iOS apps windows platform එකට port කරන්න සේරම infrastructure එක windows වලින් දීලා තියනවා. windows use කරන පිරිස මදි නිසා වෙන්නත් පුළුවන්. කොහොම නමුත් windows වලට දැනට COC නැහැ. ඒ වෙනුවට Cloud Raiders කියලා game එකක් තියනවා. COC වගේම තමයි. මේ කතාව කියන්නේ windows ගැන මුකුත්ම නොදන්න කෙනෙක්. ඉතින් මේ වගේ වෙලාවට දැක්කේ නෑ ඇහුනේ නෑ වගේ ඉන්න එක තමයි හොඳ. windows 10 mobile version එක මේ වෙනකොට UI අතින්, performance අතින් සෑහෙන්න ඉස්සරහින් ඉන්නවා. තවමත් වැඩ ඉවර නැහැ. මොකද තවත් updates ගොඩක් එන්න තියනවා. මේකත් අර මුලින් කිව්ව කතාවම තමයි. ගොඩක් වෙලාවට මේක කියන කෙනා කියන්නේ කාගෙන් හරි අහගත්ත කතාවක්. Viber අලුත් update එකේ video call feature එක release කරා windows usersලට. දැන් ඉතින් කියන්න පුළුවන් අපිට කොච්චර කලින් ඉඳලා තිබ්බද කියල. ඒවා ඉතින් ගණන් ගන්න ඕන කාරනා නෙමේ. මොකද කවදද තිබ්බේ කියන එක වැදගත් නෑ. තියනවද නැද්ද කියන එකයි වැදගත්. ඒ වගේ windows වල විතරක් තියන features ගැනත් අන්තිමට කියන්නම්. දැනට snapchat app එකක් නැහැ. නමුත් windows 10 වලට app එකක් develop කරමින් තියනවා කියලා තමයි කියන්නේ. ගොඩක් වෙලාවට මේ අවුරුද්දේ අග වෙන්න කලින් release කරයි. මේකටත් ඉතින් කලින් කතාවම තමයි. Windows 10 වලට අලුතෙන්ම instagram app එකක් release කරා. සේරම features එක්ක. මේකටත් ඉතින් කලින් කතාවම තමයි. හැබැයි තාම call, video call නම් නැහැ. ළඟදීම release කරනවා කියලා තමයි updates වල තියෙන්නේ. මේ කියන කතාව තරමක් දුරට ඇත්ත. මොකද අනිත් platform වල තියන games windows වලට නැහැ. ඒ වගේම තමයි ඉතින් windows වල තියන games අනිත් OS වලටත් නැහැ. කලින් කිව්වා වගේ COC windows වලට නැහැ. ඒ වගේම Ingress, Pokeman GO වගේ games නැහැ දැනට. දැන් බලමු මොනවද තියෙන්නේ කියලා ඇත්තටම store එකේ. මේ තියෙන්නේ store එකේ තියන games වලින් ටිකක්. ඇත්තටම දැන් තමයි windows phone වල rising time එක පටන් අරන් තියෙන්නේ. හරියට android froyo, gingerbird ආපු කාලේ වගේ. ඒක නිසා ගොඩක් developersලා windows 10 platform එකට move වෙන්න පටන් අරන් තියනවා. ඒ වගේම අලුත් apps හැමදාම වගේ release වෙනවා. දැනට තියන apps update වෙනවා. Android store එක එක්ක බලද්දී windows store එකේ apps අඩුයි. ඒක පිළිගන්න පුළුවන්. ඒත් store දෙකෙන් secured වැඩිම store එක ඇහුවොත් දෙපාරක් නොහිතම windows කියලා කියන්න පුළුවන්. මොකද store එකේ Malfunctioning apps එකක් වත් නැහැ. ඕනෑම app එකක් අරන් use කරන්න පුළුවන් බය නැතුව. හැබැයි ඉතින් Google Play එකේ එහෙම කරොත් නම් sorry තමයි. Apple Store ඒකත් security අතින් ගොඩක් හොඳයි. අද වෙනකොට android use කරන පිරිස 54% වගේ ලොකු ගානක්. ඇත්තටම ඇයි android මෙච්චර ජනප්‍රිය වුනේ?? Android මුලින්ම release කරේ 2006දි. අද වෙනකොට අවුරුදු 8ක් ගෙවිලා ගිහින්. 2007, 2008 කාලේදී ජනප්‍රියම mobile OS එක උනේ Symbian OS එක. 2009දි වගේ තමයි Symbian අන්තිම version එක ආවේ. මේ කාලේදී තමයි smart phone සමාජෙට එන්න පටන් ගත්තේ. ඉතින් නොමිලේ තියන OS එකක් නිසාත්, Community support, High Customizability වගේ දේවල් නිසා ප්‍රධාන පෙලේ Mobile Brand වෙන HTC, Samsung, LG හැමෝම android වලට මාරු උනා. එහෙම නොකරේ Nokia, Blackberry කියන සමාගම් දෙක විතරයි. මේ විදියට තමයි android වලට ආරම්භය ලැබුනේ. ඊටපස්සේ Open Community එකක් නිසා developersලා එකතු වුනා. Company වලින් android base කරගෙන app release කරන්න පටන් ගත්තා, Google එකත් ලොකු සහයක් දුන්නා. ඒ හැමදේම එක්ක තමයි අද තියන OS එක සහ Community එක හැදිලා තියෙන්නේ. windows වල කතාව මීට වඩා වෙනස්. Microsoftලා Windows platform එක Google වගේ open කරේ නැහැ. ඒ වගේම OS එකට features inject කරන විදිය ගැනත් ලොකු අදහසක් තිබ්බේ නෑ. කොහොම උනත් බලාපොරොත්තු උන විදියට developersලා එකතු උනේ නෑ. apps මහ ගොඩක් හැදුනෙත් නෑ. හැබැයි දැන් ඒ අඩුපාඩු හදාගෙන අලුත් ගමනක් පටන් අරන් තියනවා. Windows Insider Program එකෙන් User Feedback දෙන්නත්, Community එකෙන්ම control වෙන voting mechanism එකකුත් තියනවා. මෙතැනදී windows insidersලා විදියට එකතු උන අය ලොකු contribution එකක් කරා පලවෙනි windows 10 release එකේ ඉඳලම. Windows mobile වල මොනවද තියෙන්නේ?? අලුතෙන් release උන windows 10 කියන්නේ අලුත් features ගොඩක් හඳුන්වලා දුන්න Windows version එකක්. දැනට Redstone 1 කියන version එක තියෙන්නේ. Redstone 2 August 2 release කරනවා. මේ තියෙන්නේ අලුතෙන් එකතු උන දේවල් වලින් මතක් කරොත් හොඳයි කියලා හිතුන ටිකක්. අපි type කරන වචන වලට අදාළ Suggestion දෙන එක වගේම, ඒ වචන වලට අදාළ emoji එක display වෙන feature එකත් අනිත් platform වල නැති දෙයක්. iOS 10 වලදී තමයි මේක හඳුන්වලා දුන්නේ. මේ feature එක හඳුන්වලා දුන්නේ messages වලට action center එකේදිම reply කරන්න පහසු වෙන්න. මේ feature එක දැනට අනිත් platform වල නැහැ. android වලටත් nougat වලදී තමයි හඳුන්වලා දුන්නේ. මේ කියන්නේ Sinhala වලට හොඳටම support කියලා. windows 8 තියන කාලේ ඉඳලම අනිත් OS වල සිංහල පෙන්නන්නේ නැති කාලේ (දැනටත් සමහර ඒවා වල නැහැ ) windows phone වල සිංහල ලස්සනට පෙන්නුවා. 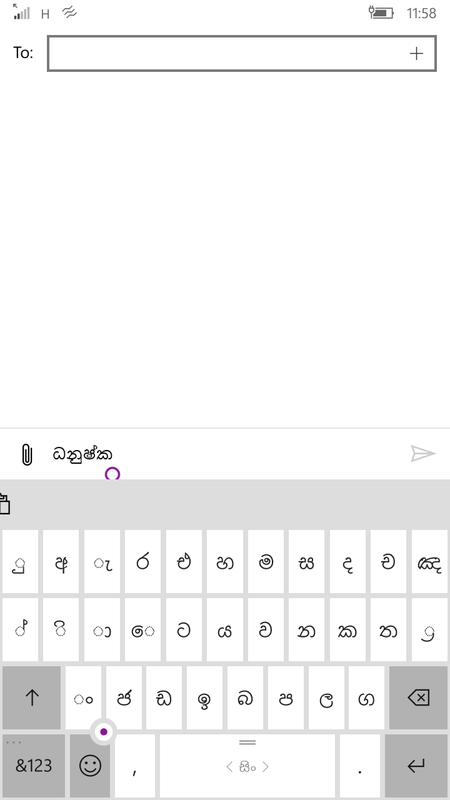 ඒ වගේම දැන් සිංහල keyboard එකකුත් add කරලා තියනවා. මේකත් windows 10 වලට අලුතෙන් ආපු feature එකක්. 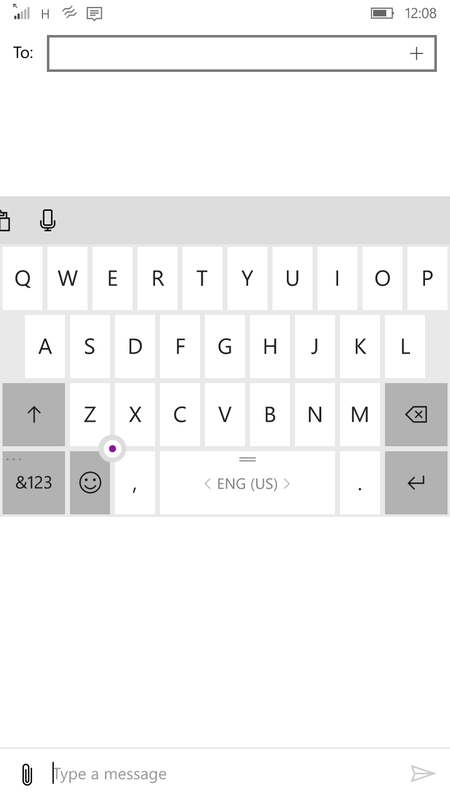 අපිට keyboard එකේ position එක මාරු කරන්න පුළුවන්. 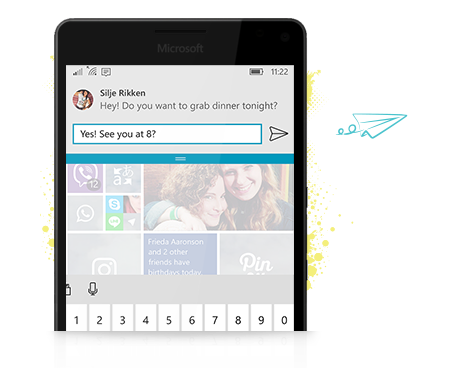 spacebar එක long press කරාම keyboard එක unlock වෙනවා. ඊටපස්සේ move කරන්න පුළුවන්. (insider fast ring එකේ තියෙන්නේ). ඒ වගේම keyboard එක landscape mode එකේදී left, right side වලට මාරු කරන්නත් පුළුවන්. අනිත් OS වලට කලින් තමයි windows usersලා offline maps use කරේ. ඒ වගේම දැනුත් offline maps support එක වැඩිම windows. Windows වලට virus guard apps නැද්ද? මොකටද guard එකක් virus නැත්තන්. windows 10 වලදී Cortana ලොකු role එකක් play කරනවා. Message reply, Call remind, Reminders, event handling, Music Search, Web Search වගේ දේවල් ප්‍රධාන වෙනවා. fast and reliability අතින් ඉහලම broswer එකක් විදියට හඳුන්වන්න පුළුවන්. ඒ වගේම Extension Support (mobile එකට තවම නැහැ), Page rendering time වගේ features සෙට් එකක්ම තියනවා. අපි කැමති article එකක්, page එකක් පස්සේ කියවන්න save කරගන්න පුළුවන්, ඒ වගේම Reading Mode එක බ්ලොග් කියවන අයට ගොඩක් වටින feature එකක්. Reading List එකේ තියන article වෙනත් වෙලාවක උනත් internet නැතිව කියවන්න පුළුවන්. මේකෙන් පුළුවන් phone එක screen එකකට connect කරලා PC එකක් වගේ වැඩ කරන්න. ඒකට ඉතින් continuum එක ගන්න වෙනවා. $99ක් වෙනවා price එක. Raw photos වලට support කරේ windows 8.1 තියන කාලේ ඉඳලා මට මතක විදියට. iOS වලට raw photos feature එක එන්නෙත් iOS 10 වලදී. මේ feature එක insider build වලදී ගොඩක් කතා බහට ලක්වුණ feature එකක්. Microsoft එකෙන් මේ feature එක නවත්තන්න හැදුවත් insider usersලා request කරපු නිසා අලුතෙන් add කරා. මේකෙදි windows phone එකට එන message වලට අනිත් windows 10 devices වලින් reply කරන්න පුළුවන්. UWP එහෙමත් නැත්තන් Universal Apps කියන්නේ windows 10 එක්ක හඳුන්වලා දුන්න අලුත් දෙයක්. සරලව කිව්වොත් මේ කියන්නේ අපේ PC, Tablet, Mobile වගේ Windows 10 devices සේරම වෙනුවෙන් එක app එකක් විතරක් release කරන එක. එකට move වෙලා තියනවා. මේ අවුරුද්ද ඉවර වෙද්දී අනිත් apps වලිනුත් බොහෝ ප්‍රමාණයක් UWP වලට convert කරයි. මේ වගේ තමයි windows වල තියන features. කොහොම උනත් windows වල තියන features අනිත් OS වල features වගේ market කරේ නැති නිසා ගොඩක් අය හිතන්නේ windows use කරනවා කියන්නේ මුකුත් apps නැතුව. call sms විතරක් ගහන්න පුළුවන් phone එකක් කියලා. ඒත් ඇත්ත කතාව මොකද්ද කියලා දැන් පැහැදිලි ඇති. අනිත් දේ තමයි, ලෝකේ තියන සේරම apps store එකේ තියෙන්න ඕන නැහැ. අවශ්‍ය main apps තිබුනා නම් හොඳටම ඇතිනේ. ඒ වගේම official apps නැති ඒවාට 3rd party apps තියනවා. කොහොම උනත් user කෙනෙක් විදියට හිතුවම windows සෑහෙන්න කාලයක් ගත්තා දැන් තියන තත්ත්වෙට එන්න. නමුත් developer කෙනෙක් විදියට කල්පනා කරාම මේක large project එකක්. ඇත්තම කිව්වොත් Android Release එකක් වගේ OS release එකක් විතරක් නෙමේ. windows PC, windows mobile, Surface, HoloLens වගේ platform ගොඩක් maintain කරන්න තියනවා. ඒ නිසා තමයි normal mobile os release එකකට වඩා කල් යන්නේ. August 2 වෙනිදා Anniversary update එක එනවා. මෙතන කිව්වේ නැති ගොඩක් features add වෙනවා කියල තමයි windows insider program එකෙන් කියන්නේ. ඇයි windows apps හැදෙන්නේ නැත්තේ? windows 8.1 කාලේදී Microsoft එකෙන් developersලට ගොඩක් ලොකු support එකක් දුන්නා කියලා පෙනුනේ නෑ. අවශ්‍ය environment, tools වගේ දේවල් තිබුනත් developersලගේ ලොකු උනන්දුවක් තිබුනේ නෑ. කොහොම නමුත් අලුත් universal apps concept එකත් එක්ක ලොකු වෙනසක් ඇති වෙලා තියනවා. ගොඩක් apps store එකට ආවා අලුතෙන්. තිබුන apps refined උනා. iOS apps windows platform එකට port කරන්න සේරම infrastructure එක windows වලින් දීලා තියනවා. developersලට දැන් chance එකක් තියනවා කලින්ටත් වැඩිය apps build කරන්න. මේ විදියට තමයි ‘Windows phone වලට apps නැහැලු’ ඉවර වෙන්නේ. ජය !! What is community-driven it will touch the awesomeness deeply. This entry was posted in News, Windows Phone and tagged mobile, redstone, windows, windows mobile by dhanush_c. Bookmark the permalink. Niyama Post 1k.kiyanna wachana naa. මේ Play Store එකේ වැඩිම rating තියන app වලින් ටිකක්. මේ කියන්න හදන්නේ අනිත් platform වල තියන ප්‍රධාන apps වලට සමාන apps features අඩුවක් නැතුව තියනවා කියන දේ පැහැදිලි කරන්නයි. එහෙම නැතුව අනිත් store වල තියෙන්නේ app මෙච්චරයි කියන්න නෙමේ. 😀 prisma kiyanne eka app ekak witharane aiye.